With Gov. Rick Perry expected to sign House Bill 2 into law, abortion rights groups are considering a lawsuit against the state as one option to attempt to block implementation of the legislation. As an omnibus bill restricting abortion access in Texas makes its way to Gov. Rick Perry’s desk, opponents of the measure are already weighing the possibility of suing the state to stop implementation of the regulations, which lawmakers approved last week. “There are no decisions about litigation, but I think that may be the course we have to follow,” said Terri Burke, executive director of the American Civil Liberties Union of Texas. Burke said the ACLU Texas legal team is evaluating potential challenges to the bill and that any litigation would be part of a larger strategy that includes attempting to influence elections. The organization is one of a handful considering a legal challenge to the restrictions. But Kyleen Wright, president of Texans for Life, said recent cases such as the conviction of Pennsylvania doctor Kermit Gosnell bolster the argument that HB 2 provides necessary reforms to ensure safe abortion procedures. Wright said the bill's ban on abortions after 20 weeks is "pushing the envelope a bit," but she added that that component is based on laws in other states that have not been challenged. In addition to banning abortions after 20 weeks of pregnancy, the Texas bill approved last week would restrict use of the medication abortion drug RU-486, require that abortion providers have hospital privileges and require abortion facilities to meet ambulatory surgical center standards. Proponents of the bill say it will protect unborn children and the health of women. Opponents worry that it will shutter most abortion facilities in Texas and force women to seek unsafe abortion alternatives. Attorney General Greg Abbott’s office “will be prepared to defend the law in court,” spokesman Jerry Strickland wrote in an email, adding that he would not comment on a lawsuit that has not yet been filed. Planned Parenthood, which helped organize opposition to HB 2 and was one of the groups to challenge a 2011 Texas law requiring sonograms before abortions, is “evaluating all of our legal options,” said spokeswoman Danielle Wells. The timeline for undertaking a legal challenge remains unclear, though. Talk of potential lawsuits arose during the extensive debate over the bill in committee hearings and on the Senate floor. But reproductive rights groups are waiting for Perry to sign the bill before taking legal action, Burke said. The bill is set to take effect 91 days after the special legislative session ends. 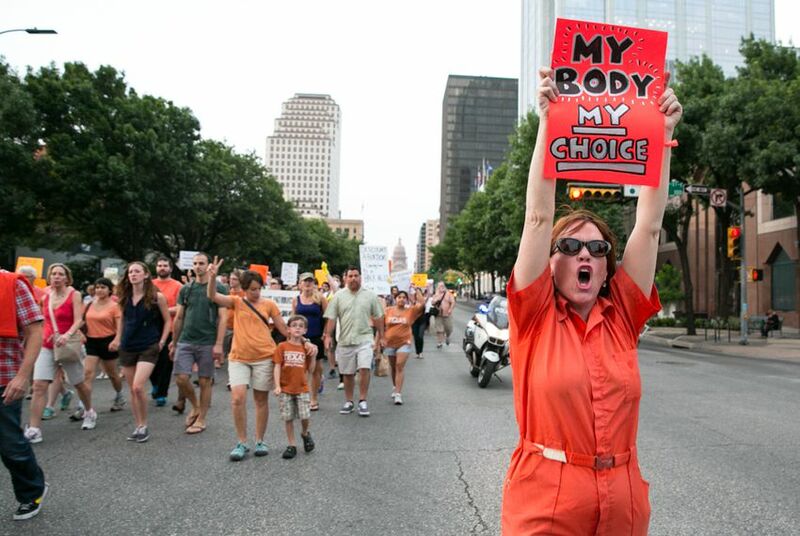 Crepps said the Center for Reproductive Rights is talking with Texas-based abortion providers and is considering a legal challenge to the abortion restrictions. She would not elaborate on which providers the center was speaking with, citing attorney-client privilege. The center, which Crepps said had been following the debate over HB 2, also challenged the 2011 sonogram law and has a “long history of bringing litigation against Texas,” she said. Both Crepps and Burke said that if a lawsuit is filed, it would likely happen before the 91 days end, and the groups could seek an injunction to block the implementation of some compenents of the new law. Similar legislation in Georgia, Alabama and Wisconsin has been temporarily blocked pending court rulings. And the 20-week ban in the Texas law has been compared to an Arizona law that was recently overturned by the California-based U.S. 9th Circuit Court of Appeals. Crepps said an initial challenge in Texas could focus on three main parts of HB 2 — the 20-week ban on abortions, regulations on the medication abortion drug RU-486 and the requirement that abortion providers have hospital privileges. The fourth part of the bill, which requires abortion facilities to meet ambulatory surgical center standards, would not take effect until 2014. Wright said reproductive rights advocates might decide not to challenge the legislation knowing that the U.S. 5th Circuit Court of Appeals "supports reasonable restrictions" for abortion providers. Wright said suing to stop implementation of HB 2 would be an uphill battle, given the "thoughtful and lengthy planning process" that went into crafting it. "There's a lot at stake for [HB 2 opponents], and I think they're finding the bill was crafted to withstand a legal challenge," Wright said. Crepps said she could not say with certainty whether the Center for Reproductive Rights would bring a lawsuit against the state, but she said it “would be very difficult to sit by” and let HB 2 take effect. Although a lawsuit over the abortion restrictions could potentially make its way to the Supreme Court, Crepps said that whether the justices would hear it would be hard to predict and could be influenced by the outcomes of lawsuits brought against other states with similar abortion regulations.